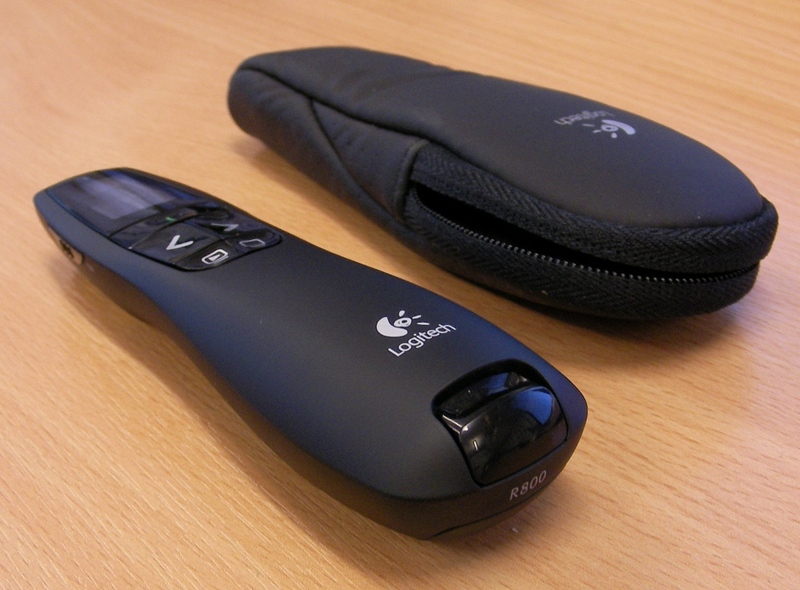 So when they gave me the CS7004 course to teach in college this year, I went a little mad for an hour there, and after I got back up off the floor and cleaned the froth off the keyboard, it turned out I’d ordered this, Logitech’s top-of-the-line presenter remote/laser pointer gizmo. It arrived last Tuesday, just in time to not be around for the largest presentation I’ve done for a few years, but I’ve been using it since for lectures in CS7004. And I have to say, it’s very nice indeed. First off, the basics are perfect. Insert two AA batteries, pull the USB receiver from the unit and plug it into the laptop’s USB port and it just runs. Powerpoint under Windows you’d expect, but for me it worked without a hitch for OpenOffice Impress under Debian Squeeze. All the usual features are flawless, the weight is just about perfect. No hinky little quirks anywhere that I’ve found since I got it. But it’s the little touches that make the R800 so nice to use. The soft leather case it comes with, the soft-touch coating on the unit itself, the general ergonomic fit of the unit are all lovely. 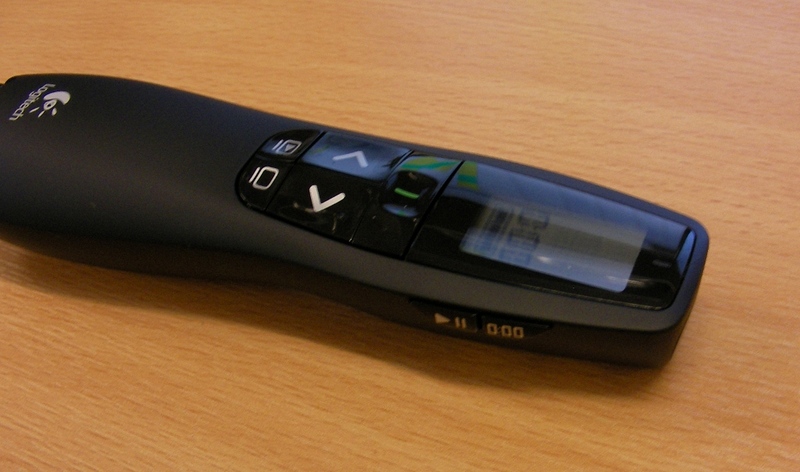 I’ve used a few different presentation remotes before, and the R800 feels better in the hand than any of them. 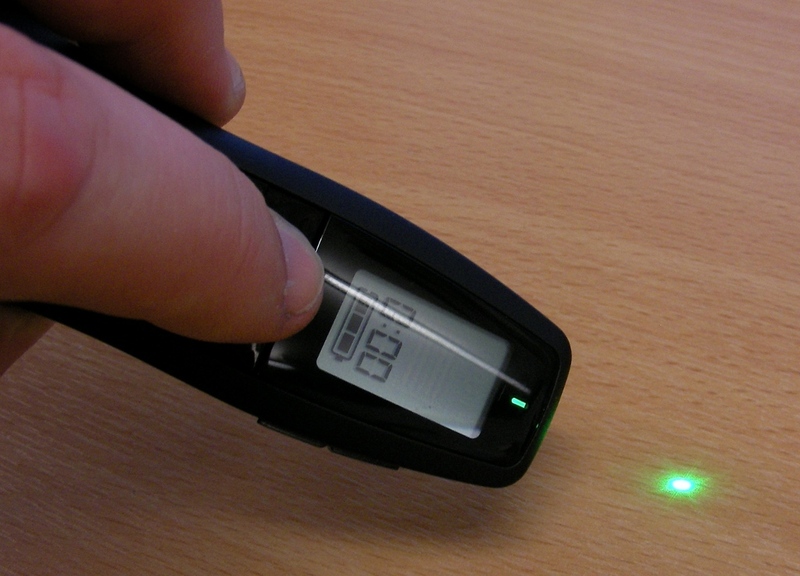 The laser pointer, being green, is remarkably bright in appearance – dazzling at close range even by reflection, despite only being a class II laser as opposed to the usual class IIIa/IIIb red lasers in most pointers. It’s well collimated, with the beam still precise ten metres away. The R800 has an internal countdown timer to aid in keeping talks short, which is set and controlled by the buttons on the right of the unit. A silent vibrating alert happens once at five minutes to go, twice at two minutes, and three times when the timer runs out, at which point it counts upwards to track overrun. It’s a shame you can’t count up as a seperate function, that would be handy when rehearsing talks ahead of time, but since it doesn’t display seconds anyway, I’m probably not missing much. The graphical indication of the time running out as a vertical bar chart is a nice touch as well. 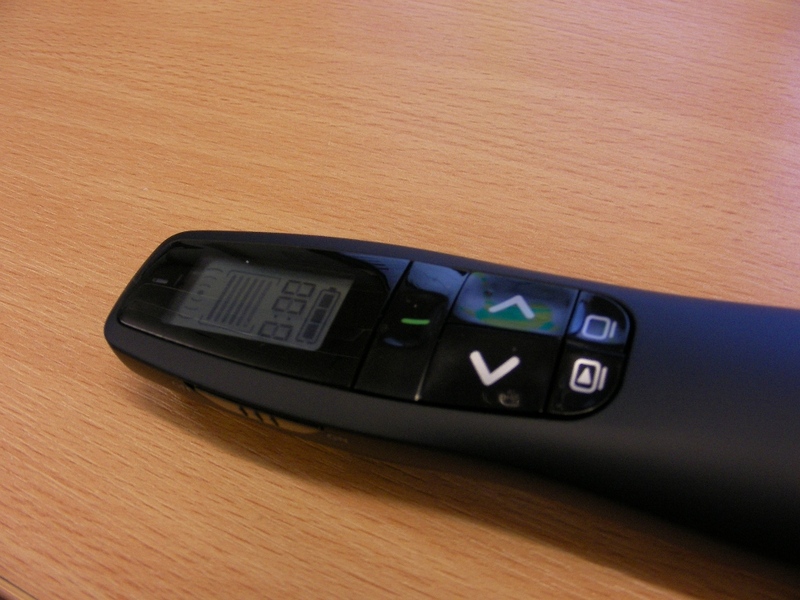 It’s handy to have the on/off slide switch (on the left of the unit) to preserve battery life for those days when you drop the remote in a bag and something bumps up against it and holds down the laser button, eating battery life. 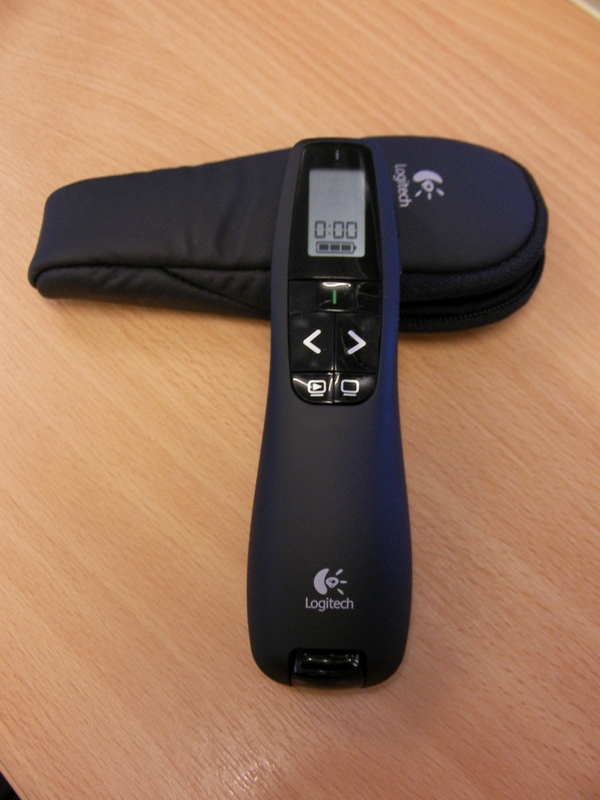 The forward/backward and laser buttons are sufficiently large that you don’t confuse them unless you’ve got an awkward grasp of the remote, which happens rarely because it naturally fits into the right spot in your hand. The slideshow start/blank screen buttons are also handy when stopping mid-talk to answer a question or use the whiteboard behind the projection screen. All in all, it’s a good tool and a nifty gadget. But the madness is the price. It set me back €80 on ebay – and €20 more for customs charges. I know, that’s made back in a lecture hour or two, but it’s still way too much. Overall, I think I’d sanely recommend getting the R400 instead, which seems to be the same thing but with a red laser pointer and without the timer and alerts, for half the price. I’ll grant you the green laser is far more bright in appearance, and the timer’s really handy in some cases – but unless this doohickey has a four-year lifespan and you use it a lot (like I’m doing at the moment), I don’t think it’s worth it. That’s not to say remotes aren’t worth getting, by the way – as Presentation Zen has pointed out more than once, they’re not optional, they’re required in order to give a good presentation (and he’s right). And if you’re pitching to VCs for funding in the millions-of-euros range – where unobtrusively tracking time during your presentation is that important, your milage may vary a lot. Certainly I missed it a lot at the Big Ideas 09 event. You don’t want to be having to keep traffic light systems in your field of view if you can offload the work to a vibrating alert. Previous Post: Wi-Fi Direct a bomb? Hi Mark, I have the baby brother of this one and I really like it. I know what to do now when I need to upgrade. How did you get on with the Nokia E71? My beloveds are wondering what to get me for Christmas, and I’m after a good e-mail on the go phone. Still using the e71, haven’t had too many problems with it at all. The camera is appallingly bad for a phone of its class though. Normally I wouldn’t mind, but I can’t even record a whiteboard with it, it blurs so badly. The keyboard is very usable, the software is quite stable, and I’m using Gravity on it as a twitter client quite a lot these days I find. However, I’m looking at the Nokia N900 and wondering whether I can really justify spending €600 on a phone because it really does look like the next step up from the e71 (the e72 is barely a tweak on the e71, the N900 is a proper step). Thanks, Mark. I’m not that bothered about a camera. I need to pick up e-mail on the move more than anything else. Maybe I need one of those mini laptops, not a phone at all? The netbooks would work too, we’re testing a Samsung NC10 here and it’s a lovely little bit of kit. But you won’t have the phone unless you carry a seperate one.